A two-month website completed over a one-month timeline. Project Management in web design is crucial to having sites delivered on time and on budget. And the Tradies Heaven site is living proof. Melbourne’s Cheapest Cars aka the brains behind Tradies Heaven, invited us over to brief us on the new site they required before grand opening day on the 22nd of March 2019. Our team went to work to put together a first round of mockups for the homepage. We do this before we start building each website to best capture the look and feel our clients are after. 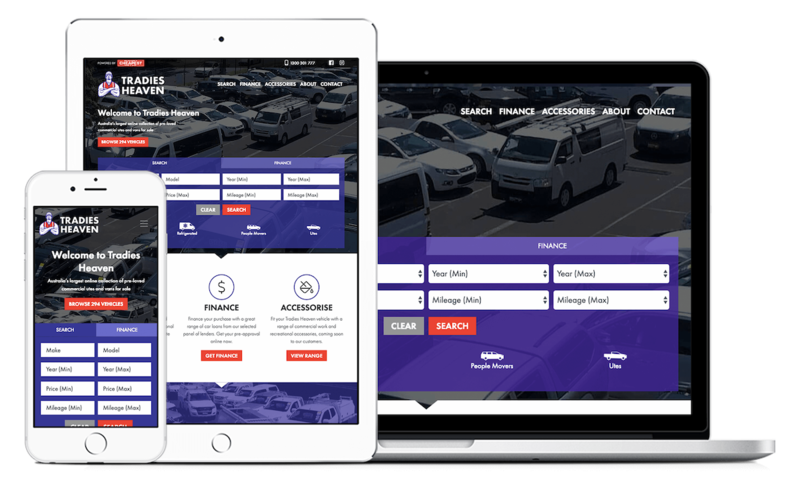 We also completed mockups for the vehicle description and stock pages to illustrate a clear pathway to search for cars online. Once the mockups were approved by management, we set up a timeline consisting of development tasks to be completed by the March 22 deadline. By using online project management tools such as Asana and by maintaining regular communication with the internal and external teams, we were able to create a clear roadmap to have this project delivered to a high standard and on time.